I'm quite the Doctor Who fan (in case you already hadn't figured that out, and I won't deny that the main reason this movie blipped on my radar at all was precisely because Matt Smith was in it. And while Smith as the Eleventh Doctor isn't quite my favorite incarnation of the Doctor thus far (Tennant forever! ), his participation in a project with a rather distinct LGBT tone to it naturally got me curious. Christopher and His Kind is actually more of a dramatic biopic more than anything else, which does lend the movie a certain degree of relevance versus your typical pink movie romp. Plus it originally aired on TV, so that certainly helped temper the naughty bits to a decent degree. I wasn't quite sure if I was ready to see "The Doctor" as a gay character of any sort - if anything it was always easier to think of him somewhat asexually before River Song entered the picture. But of course each actor is entitled to demonstrate his range through different projects of different natures. Forever typecasting Matt Smith as the Doctor alone would be totally unfair. Synopsis: Christopher and His kind is a 2011 BBC television biographical drama movie based on Christopher Isherwood's autobiography. It was directed by Geoffrey Sax with a screenplay by Kevin Elyot. The whole movie is framed as a flashback given Christopher Isherwood (Matt Smith) starting to write his autobiography in 1976. Thus we are brought back to 1931 just as a younger Christopher is due to set off for Berlin despite the admonitions of his family. On the train to Germany he meets Gerald Hamilton (Toby Jones), a fellow Englishman of Irish roots who recommends that Christopher try staying at the same boarding house where he resides. Once in Berlin, he meets up with his friend Wystan Auden (Pip Carter), who then introduces Christopher to a gay night club called the Cosy Corner. From this point on we start following various relationships that Christopher fosters while in Berlin. For example, there's Jean Ross (Imogen Poots), an aspiring actress who is trying to get discovered while singing for some night club. Then of course there's Wilfrid (Iddo Goldberg), a wealthy Jewish businessman whom Christopher is teaching English to. But then comes along Caspar (Alexander Dreymon), one of the male prostitutes at the Cosy Corner with whom he starts a rather intense relationship. From the setting of the movie, you don't need to be a historian (or a Time Lord?) to figure out that the rise of Nazism will play a bit of a factor in this story. And it's not just a small bit either, and different characters seem to challenge Christopher with their different views on Nazism. But more than that, there's also the pressure for Christopher to take a more active stance on the whole thing as well - something he's rather reluctant to get into since he claims to be more focused on his art as a writer. Caspar is but one of Christopher's relationships and the movie makes sure to show the different people that come into his life. 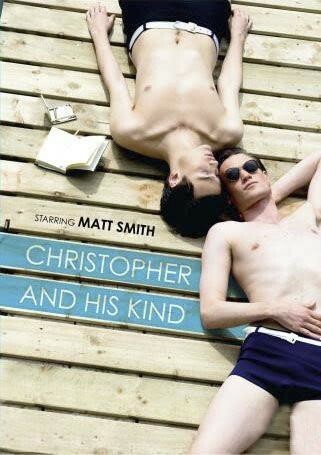 And in this regard I'm a little on the fence about Matt Smith's portrayal of this LGBT character. Maybe my difficult was due to the fact that I know him more as his character on Doctor Who, and thus it's a little harder to see him in any other context. Or maybe it also has to do with the fact that Matt Smith sort of only acts in one way that one can't quite distinguish between the Doctor and Christopher. The movie does have a lot of lovely camera work as part of the larger effort to recreate the feel of 1930's Berlin. And given how interesting the boarding house is a location plus other venues like the Cosy Corner, and the movie certainly had a nice range to present to viewers. And in the greater scheme of things seeing this world from Christopher's perspective was quite the interesting experience. Christopher and His Kind is a little heavy and one needs to focus in order to fully appreciate things. I suspect that folks who weren't familiar with Doctor Who probably had a much easier time with immersing themselves in this movie experience - so good for you guys. Thus the movie kind of gets graded on a curve with 3.5 somewhat outlandish ideas presented by Gerald to Christopher out of a possible 5.